We, as a community member site here at www.familyhistory.uk.com, have been helping fellow family history / genealogy friends for over 18 months or so. Over this period we have had Nearly 2.2 million (2,198,098) visitors and a further 7106 members joined and helped us - to help you all. We thank each and everyone of you all for your support and look forward to your continued support in the future. Over the coming weeks, we will be reviewing the site and making some beneficial changes - for the better. If anyone has any suggestions, please contact us or post in the forum. This is your community site - let us know what you think and what you would like to see. Over this period, we will be "pruning" the member list, to ensure it is fully upto date. So if anyone has any issues logging in - please let us know. Just to let you all know that we will be updating the website over the coming few weeks. Things are being added all the time. On the forum we have Zoints - the community of communities. It was origianlly developed by The Church of Jesus Christ of Latter-day Saints as an aid in their extensive genealogical research and was developed so that a common standard of communication could exist between the Church and submitters of genealogical data. From our very own National Archives the latest information for the release of the forthcoming 1911 census - updated. It really looks like that we are not in for an early treat, as some of us were expecting. As many know, we have been fighting for the earlier release. They keep on saying that "successive governments have consistently maintained that all census returns should be closed for a period of 100 years. The National Archives is committed to making census data available online. We know from our own experience the huge excitement generated by the release of any new census and recognise the great historical and research value of census information. So we are already making plans to make the 1911 census available online in just under six years´ time, on the first working day of 2012. The UK's population has broken through the 60 million barrier for the first time, figures show. The Office for National Statistics said the number rose 0.6% to 60.2 million in the year to June 2005. England accounts for 50.4 million of the total. It was the biggest annual rise since 1962, fuelled by migration from new EU countries and an ageing population. Our job of tracing our Family History in 100 years time is going to be very hard to say the least. Though most of it will be digitised. The times I have scrambled over dense vegatation covered headstones, searching for my long lost relatives. I have had a few mishaps, trips and falls, but nothing to really be worried about. Mostly It has angered me to see how the cemetarys have been left overgrown and neglected. For some time now, the local council authorities around the country have been going health & saftey mad. Here's another to add to the long list. In Gedling Borough Council, Nottinghamshire; they are actually going round and testing each headstone and if any fail the test, large wooden stakes are driven into the ground on either side of the headstone, which is then held in place with these stakes. It looks absolutely ugly. Even more, as I understand, none of the deceased family members have been told of the decision to "stake" the headstones. Imagine turning up to a family grave to see all these stakes! Unbelievable! My personal answer is that the stone masons must add some sort of internal metal stake, which firmly achors the headstone to the ground, which goes inside the headstone. Read the following story. If you have any comments, please post in the forum. Roots UK, part of S&N Genealogy Supplies, are continously adding genealogical data. The data on RootsUK.com is the same high-quality material that we have come to expect from S&N. A transcript of the complete 1851 census for England is now available with images of the original pages. The FreeBMD Database was last updated on Thu 12 Oct 2006 and currently contains 123,625,788 distinct records (158,761,747 total records). FreeBMD are transcribing the Civil Registration index of births, marriages and deaths for England and Wales, and are making the transcriptions freely available on their great free website. Please remember that they have not transcribed all the registration indexes. WITH LINKS TO THE PAST? Lion Television is looking for people who have interesting artefacts from the past. The company is making a new series for the BBC, and if you have a treasured family heirloom or strange old object you’d like to know more about, they’d like to hear from you. 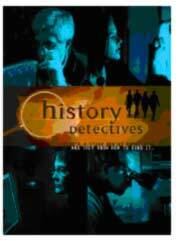 If your object is selected as a case for the History Detectives, as the series is called, they’ll investigate the item using a range of techniques. It sounds like a fantastic opportunity to find out more about the history of an old heirloom that has been handed down to you, and they’ll help you sort the fact from the fiction in its story. Or, it might just be a great chance to show off something interesting from your collection of vintage items. Visit www.rootstelevision.com and you’ll find an online channel that is fast finding its feet. The sites aim is to provide fascinating programmes for family historians. Choose which TV programme you’re interested in watching, wait for it to load – sit back, relax and enjoy - nearly like watching your own TV! The site currently contains mostly US-based content, and you can watch short, bite-sized segments or settle back and see the entire programme. Featuring at the moment is a press conference about the first emigrant passing through Ellis Island, but there are also shorts with commentaries by American genealogists. There are also VLogs, Video Logs, which are mini channels. It really needs some British content. Still, most of the content is currently free and the site’s owners would like to keep it that way. Once you’ve watched the shows you’re interested in, you can join in the online blog on the site or share your video talents by sending in a video blog to the vlog section. from Eastman’s Online Genealogy Newsletter. How Far Back Can You Get? Leaving aside questions of how patient, resourceful and lucky you are this, really depends on what sources of information is available. The British Isles has very extensive records, which are held in a variety of national and local collections. In England and Wales you should be able (especially if you are lucky to be blessed with a set of unusual surnames in your family) to trace your family roots with comparative ease back to 1837 when civil registrations of births, marriages and deaths began. Getting back beyond 1837 normally relies mainly on the use of parish registers - with luck, and allied to other types of records, these might enable you to trace your family back to the late 16th century. Beyond this can be extremely difficult, unless you can tie in to a well-documented pedigree, for example of royalty or a great land-owning family. Also many records pre 1700 are in latin.